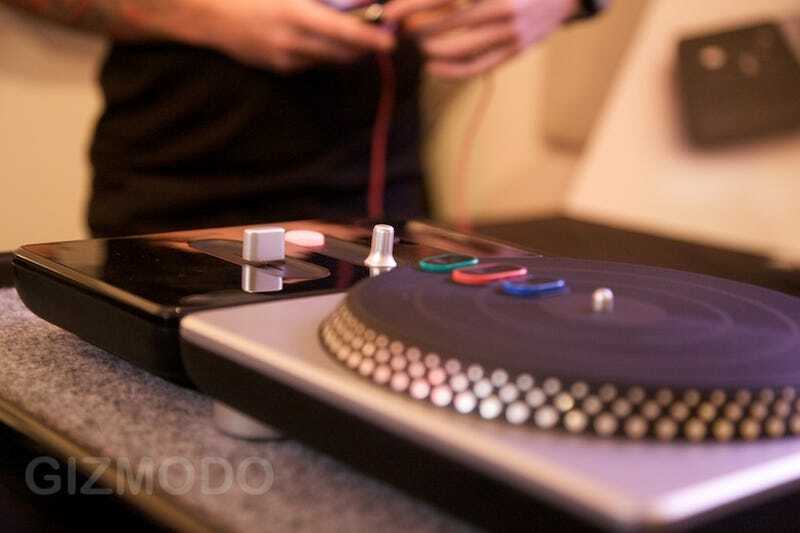 Activision is the king of experiences modeled in plastic and color-coded buttons, and DJ Hero's turntable controller might be their best simulacrum yet. It's grown up a bit since the initial reveal sprouting a glossy black panel that docks on either side of the main turntable. It holds the mixer, effects dial, euphoria button and hides the usual Xbox buttons behind a small panel up top. We didn't get to use the controller to play the game, but we handled it after the demo, and it felt remarkably solid—weighty without being heavy, the plastic adequately resilient, and not too cheap feeling. The spin action itself is super smooth and effortless, with a light wrist flick sending into a fairly zoomy spin. The Xbox buttons are hidden up top in the dockable half, to reduce the complexity of the controls as much as possible. Yes, it is wireless. Interesting trivia bit: All of the DJs in the game wear Monster's Dr. Dre Beats headphones. Guitar Hero already destroys my hand-eye coordination past medium—with buttons, spinning things, effects dials, mixers, I already know there's no effin' way I can handle this game. But I'm going to try because it looks like it makes you even more like a DJ king than Guitar Hero makes you feel like a rock god.